Ten thousand young oysters are to be placed on a Swansea Bay fishing bed, not used since the 1920s, in the hope it will become a commercial fishery. Permission was given for the plan to use the seabed off the village of Oystermouth after a request from shellfish expert Andy Woolmer. He hopes to reinstate oysters on a 70-acre bed in the bay. In the mid-1800s the oyster industry in south Wales employed hundreds of people but over fishing led to its demise. The oyster beds stretched from Porthcawl to Milford Haven and more than 200 fishing vessels were used to transport the hauls. Fishermen exported nine million shellfish to London and the Continent but it was an industry killed off by over-fishing and improvements in methods of transport. 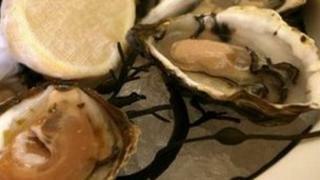 The initial part of the new project will see if the juvenile oysters, which are coming from Stranraer in Scotland, can survive in Swansea Bay. Marine biologist Mr Woolmer said: "We're going to reinstate some historic beds. "We're going to put down baby oysters, probably about half grown, and we're going to monitor those to see if they survive, because there's no guarantees here. "If they grow and survive then we can start adding more oysters, but what I'm more excited about is the potential for the oysters that we've put down to breed." The project has been welcomed by villagers in Oystermouth. Local fishmonger Janet Green said she would like to see a return of the local oyster industry. Britain's oyster beds have never recovered from over-fishing in the 19th Century when the railways carted shellfish to London. Only a few beds remain scattered round the coasts now and figures last year showed the total area is estimated to have been reduced by perhaps more than 90% - some scientists think 99%.